What should you do if you get some noxious substance in your beautiful, carefully maintained hair? Accidents like this can be unavoidable, and folk wisdom often says that the situation is hopeless - you'll just have to cut your hair off. Naturally, this can be heartbreaking. The good news is that it isn't necessary. Almost all substances can be removed from hair if you know what you're doing. Here's how. Different types of paint require different removal techniques. If you're not sure what type of paint is in your hair, start by coating the effected area with your usual shampoo. Leave it for ten minutes, then gently wash it out. If this doesn't loosen the paint (you may need several applications to remove it entirely), it's safe to assume that it's acrylic or oil-based. In this case, olive oil or baby oil is the most effective remedy. Warm and soften your hair with hot water, then gently but persistently massage the oil into the affected area. This should gradually break the paint down. Never use paint thinner in your hair as this can stain or damage it. The easiest way to remove tar from hair is to dissolve it in a thick oil. Smooth peanut butter or lard are ideal for this. Just rub it in firmly, leave it for ten minutes, then gradually work it loose with your fingers. You will need to use a strong comb to draw out the tar as it starts to break down. Use a hair tie and comb at an angle to avoid putting too much strain on the roots of the hair. 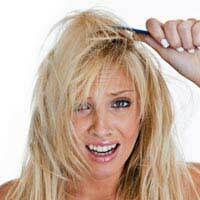 Chewing gum and bubble gum often find their way into hair, and trying to tug or comb them out can just make the problem worse. This is another instance in which peanut butter can help, but if you're dealing with a larger area of hair, it can be very messy. Fortunately there are easier methods. The simplest way to deal with gum is to freeze it. Put some ice cubes in a plastic bag and press them against the gum until it goes hard, then simply flake it loose. Alternatively, apply egg white to the affected area and massage it through the gum until the mixture can be combed free. This technique has the bonus of leaving the hair in good condition. Anyone can have an accident when cooking, and it's not uncommon for children to try and dye their hair deliberately using food colouring. If you catch the problem quickly, apply some lemon juice and you should be able to get most of it out. If it's been there for a while, the problem is trickier. The best way to remove food colouring at this stage is to wash and pat dry the hair, then smother it in strong shampoo (Head & Shoulders is particularly good for this). Leave the shampoo in place for ten minutes before rinsing it out. This should remove most of the colour but will leave your hair dry, so use a heavy conditioner and take extra care of until it feels normal again. If you need to repeat the shampoo treatment, wait for two weeks first. Getting glue out of hair can seem like a nightmare, and it's something a lot of parents have to deal with. The good news is that there are now special products designed to deal with it. Your local hair salon can sell you a remover specially formulated for dissolving the glue that holds in hair extensions. It also work on most other kinds of glue and it won't damage the hair itself. Although superglue may seem like the worst substance to remove, it's one of the easiest. It breaks down when immersed in hot water, so all that's needed is a hot bath and some gentle finger-combing. Don't use an actual comb until the hair feels smooth and normal.